Both Microsoft and Google have long worked on getting users answers without having to click through a number of websites. At Google, the current result of this is the Knowledge Graph and at Bing, it’s the company’s entity engine (previously referred to internally as Satori). Both search engines currently offer very similar experiences related to these engines. Search for “Albert Einstein” in Google and Bing, for example, and the right sidebar will give you plenty of information about him. But both companies have a different approach to how they plan to push these entities forward. Earlier this week, I sat down with the lead of Microsoft’s Bing Experiences group, Derrick Connell, to discuss the state of entities in Bing and the company’s vision for the future of entities in its search engines. Microsoft clearly has big plans for using entities in Bing and products that rely on it; the company plans to open up a part of this entity engine so more third-party sites will be able to highlight some of their features on Bing. Besides getting to an answer, though, search also has to be about being able to take action. That’s been at the core of Bing’s philosophy from the beginning. Microsoft often referred to Bing as a “do engine” when it first launched, for example. 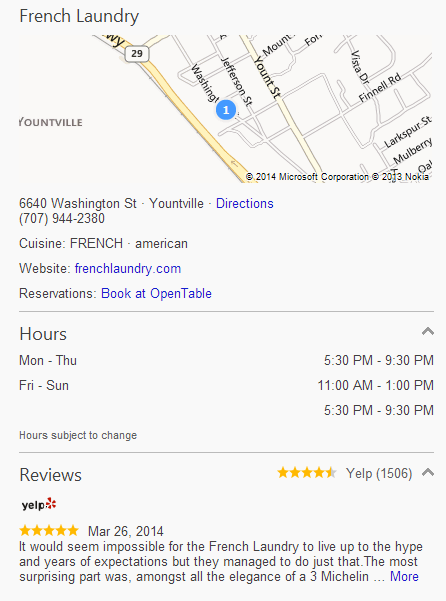 Since then, Microsoft has integrated more data sources and the ability to take more actions, including booking tables through OpenTable, for example (something Google also offers). It also integrated your LinkedIn profile (if you opt in to this), so search results for people will often include information about people who are in your professional network. The question in the long run then becomes: how do you associate actions with entities? It’s pretty much impossible for a single company to be able to cover every aspect of what its users want to do online, after all. Today, this means having partnerships with Yelp, OpenTable, TripAdvisor and others, and Microsoft then highlights the actions they make possible on its search engine. In the long run, though, Connell envisions an open ecosystem where any site can make actions available using a standard markup language (he mentioned schema.org as an option in our conversation). Then, when a user looks for an entity, Bing could map this to an entity provider and shorten the path users take between searching for something and putting this knowledge into action. Ideally, this could even mean taking the action right on Bing (maybe even with a single click), but Connell acknowledged that issues around identity and login management will probably mean users will have to take most actions on a third-party site. Assuming enough third-party sites opt in to this kind of action entity system, the problem for Microsoft becomes one of relevance. “As you get more partners participating, which provider you surface becomes a relevance problem,” Connell noted. What, after all, happens if you have two competing restaurant reservations sites? Which one do you highlight? How do you keep spam out of this system if you make it completely open? Connell assumed that this is something his team can figure out and that he would rather show more than one option anyway. On Windows, Microsoft has already launched something akin to this. Apps, after all, can all integrate themselves into the Windows Search tools. One thing Connell also stressed repeatedly in our chat is that he believes there are very few companies who can actually pull a project like this off. In his view, Microsoft could be one of them, not in the least because it can offer users access to both public and private entities. Enterprises, for example, could use this scheme to make information that only matters to their employees available to them. Through Sharepoint, Office and other tools, Microsoft could serve up a wealth of information — and actions — to its users based on these sources. Not all of this, of course, would be relevant in a search engine, and Bing.com may not always be the best place to highlight this info. But what if you could write a document in Word and the system could bring up relevant information as you type from both public and private sources? Chances are, this ecosystem Connell envisions won’t arrive until a few years from now. Indeed, he expects that we still have a good 10 to 20 years of advancement in this space ahead of us.